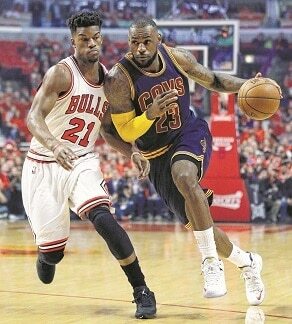 Cleveland Cavaliers forward LeBron James, right, drives past Chicago Bulls guard Jimmy Butler during the first half of Game 4 in a second-round NBA basketball playoff series May 10 in Chicago. CLEVELAND — High above downtown, there’s no visible evidence of a painful 51-year professional sports championship drought — the longest for any major U.S. city. Atop Terminal Tower, 42 stories over revitalized Cleveland, heartbreak and curses don’t exist. Just a spectacular view. Directly below the centerpiece of Cleveland’s skyline, the city is undergoing a modern renaissance as heavy construction equipment transforms Public Square in advance of the city hosting the 2016 Republican National Convention. Orange barrels line nearly every street. Pedestrians jam the sidewalks, all seeming to wear something with Browns, Indians or Cavaliers written on the front — or a LeBron James jersey. In the distance, the sun’s reflection dances off the windowed atrium of the Rock and Roll Hall of Fame. One man has transformed that. James has made Cleveland believe. From the moment the Akron kid turned basketball king announced he was returning home, preaching togetherness to a fan base he spurned by leaving as a free agent for Miami in 2010, a new positive vibe has enveloped a place that often sees the glass not as half full, but broken. And although the Cavs lost All-Stars Kevin Love and Kyrie Irving to season-ending injuries, James’ brilliance and gritty contributions from unlikely players like Matthew Dellavedova and Timofey Mozgov have the team within three wins of an NBA title. The Cavs are tied 1-1 with the Golden State Warriors heading into Game 3 of the NBA Finals on Tuesday night. Since the Browns won the NFL title in 1964, the city’s three pro teams and a hockey club that merged with Minnesota in 1978 have completed 143 seasons without one finishing on top. Close calls and runner-up trophies have scarred the locals. Something always cancels the parade. If not injuries, it’s Browns quarterback Brian Sipe forcing a pass and getting intercepted by Oakland’s Mike Davis in 1981 (Red Right 88 was the play call). It’s John Elway’s 98-yard march in the 1986 AFC championship or Earnest Byner’s muff at the goal line in Denver the next year. It’s Michael Jordan’s hang-in-the-air jumper over Craig Ehlo, owner Art Modell taking the Browns to Baltimore or James announcing South Beach would be his new home. Or it’s 1997, when cases of champagne and the World Series trophy were wheeled into, then out of the Indians clubhouse when Jose Mesa blew a save in Game 7 of the World Series. The drought is ingrained in the citizenry’s collective psyche — part of a Clevelander’s DNA. “I’ve only been around for 38 years of it,” said Nathan Zaremba, standing outside Quicken Loans Arena after buying a new Cavaliers cap for his 6-year-old son, Milo. Zaremba said Clevelanders know all the bad moments and experience them from the first day of their lives. Understandably, some Cleveland fans can’t shake their disbelief. After all, they’ve been raised to repeat the phrase “Only in Cleveland” any time there’s misfortune. But others remain proud, able to laugh at their own misfortune, dust themselves off and lose again. Some seem to relish the anguish. Cleveland’s time could be near, if James can turn the punching bag for other cities into a title town. As Kubinski looks out the door of her store, the thought of a parade down Euclid Avenue makes her eyes tear. This story has been corrected to show Game 3 is Tuesday night, not Wednesday night.